What have been the key successes in the fight against mortality since 1993? What gaps remain, and what is needed to address them? What about the impact of other sectors on health? How is the developing agenda for non-communicable diseases different? What is the role of the growing S&T capacity of low and middle income countries? What is happening in the international framework for monitoring research financing? 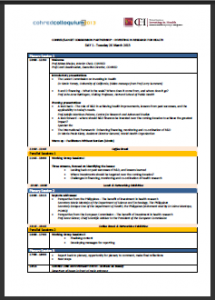 Day 2 looks at identifying, and maximising or optimising sources of financing for health research. This will be analysed from different perspectives, but always with a specific focus on the role, the needs and the responsibilities of low and middle income countries. What can funders do to maximise or optimise available resources? How can we show the real value of research and innovation through monitoring and evaluation? What is the growing role of the private sector in supporting health research in low income contexts? What are the issues which research institutions in the South face?